The New World Symphony served a bracing menu for its chamber music concert on Sunday afternoon at the New World Center, offering rarely heard Schumann and French exotica by Andre Jolivet as prelude to the program’s main course—a visionary multimedia presentation of Arnold Schoenberg’s path-breaking Expressionistic monodrama Pierrot lunaire. Schumann conceived his Marchenerzahlugen (Fairy Tales) in B-flat Major for piano, clarinet and viola in 1853, the year before mental illness would bring an end to his creative career; yet there is nothing foreboding or ominous in these four rollicking pieces. At once songful and folksy, this diverting score utilizes the same instrumentation as Mozart’s Kegelstatt Trio to similar felicitous effect. Clarinetist David Lemelin’s bright, warmly burnished tone produced a stream of lyrical melodies, assaying the gentle third movement with particular delicacy. Kerry Kavalo’s viola blended adroitly with his colleagues, blossoming as Schumann’s fantasy took wing. Michael Linville, ever dependable at the keyboard, brought depth and grandeur to the score’s more robust pages. Long before Lou Harrison and his circle of California composers became fascinated with music from the Pacific Rim, Jolivet was exploring Asian influences. Inspired by the impressionism of Debussy and Ravel and the serialism of Schoenberg, Jolivet wrote the Book of Linos in 1944, freely cross-pollinating Oriental mysticism, misty harmonies and elements of tonal ambiguity. The score is a beguiling aural tapestry and tour de force for the flute, the instrumental protagonist. Opening with a Pan-Asian threnody, the music churns with cries of pain and sudden bursts of ecstatic jubilation in volatile juxtaposition. Flutist Melanie Lancon spun a shimmering haze of Asian-tinged themes and dazzled with rapid triple tonguing in the work’s emotionally turbulent passages. Grace Browning was superbly accomplished in the complex and busy harp writing. Schoenberg’s Pierrot lunaire melds the worlds of cabaret and concert hall. Based on 24 poems by Albert Giraud, the work follows Pierrot, the powdered faced fool of the Italian commedia dell’arte, in dreams of the moon, horror, death and homesickness. The narrative is delivered in Schoenberg’s unique Sprechstimme (spoken voice) in which rhythms are notated but pitches are only approximate. Scored for five players, the score abounds in rigorous, jarring atonal modernism but also features echoes of Viennese cafe music and intimations of jazz. Director of video production Clyde Scott, lighting designer Stefan DeWilde and videographers Bruce Pinchbeck and J.T. Rooney created an imaginative visual counterpoint to the projected English translation of the text, enhancing the alternately childlike and morbid Expressionistic aspects of text and music. Particularly striking was the combination of filmed candles and a stage bathed in red light as Pierrot describes a blood-soaked communion. Bedecked in a black top and gold pants, Paula Robison pranced the stage as Pierrot, at times shrieking the text with mad abandon or nearly whispering thoughts in intimate reverie. A distinguished flutist and teacher, Robison truly embodied Pierrot, both lovable and wild. Doubling on violin and viola, Elizabeth Phelps evoked the more playful elements of Schoenberg’s phantasmagoria while cellist Joseph Lee was commanding in acerbic recitative. Marnie Hauschildt elegantly traced the important keyboard writing. Seth Morris (flute and piccolo) and Jason Shafer (clarinet and bass clarinet) nimbly sparked the wind contingent. In a strikingly conceived performance, the New World brilliantly conveyed the still shocking power and vitality of this unique masterpiece. Paula Robinson was magnificent as Pierrot. Bravo! And the ensemble did their accompanying magic with a penetrating and brilliant performance. The light design was a stimulating compliment to the verse and music. Regarding the video imagery, which I found very accomplished and poetic on its own –had I gone to see it at a theater with Schoenberg’s composition as a soundtrack–in the context of this concert performance, however, I found it obtrusive and dwarfing the ensemble, in addition to diluting attention away from Paula Robinson’s (the story teller) animated and endearing antics by forcing a very literal interpretation of Giraud’s already powerful and visually intense multilevel language. The screen images castrated the depth of metaphor and paradox and conundrum. It bullied away the audience’s participation as individuals in the creative process if only by the mere size of its footprint– in one way downgrading the verse and music combination by limiting it to those specific images in the video. A bit condescending: as if the audience might not possess the capacity to imagine with just the words and the music? Was it a production call, perchance fearing that in this day and age Pierrot Lunaire would have more drawing power with “video assist”? Perhaps in many cases it could be true, since the advent of video screens everywhere (smart phones, computers, 3D home screens) illustrate everything for us tending to weaken our imagination, and many among us might not find Giraud’s mere words and the ensemble’s and Paula’s performance of Schoenberg’s composition sufficiently stimulating on their own. I for one am an enthusiastic partisan and defender of multimedia experimentation in almost all cases, I default to no holds barred in the business of self-expression, including the theater stage where some purists might frown, but in this performance in particular I found the screen’s images trying to step in my head and found myself lowering my hand like a visor throughout the performance to block it out from my personal voyage. Again Bravo! Bravo! Bravo! To Paula Robinson and members of the ensemble. I was fascinated to hear about Paula Robison, an amazing flutist, venturing to perform the vocal parts of Pierrot and Ode to Napoleon. One misconception projected in comments: the vocalist is a narrator who describes Pierrot and the other protagonists. 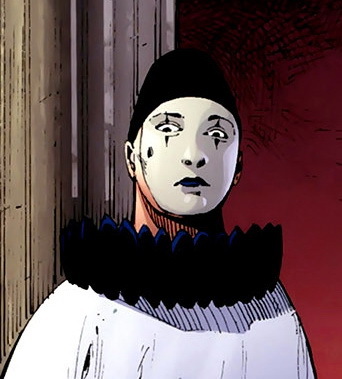 She is not personifying Pierrot.